The boys have already been asking when St. Patrick's Day is and if they might get a treat again this year. While, we celebrate St. Patrick's Day a little bit, we definitely don't go over the top (I refuse to clean up leprechaun or Elf messes). Last year, the boys made their own leprechaun traps. Bernardo actually did it for school, so of course Higgins wanted to be like his big brother. Surprisingly, the traps didn't catch a leprechaun, but there was a treat left for them. 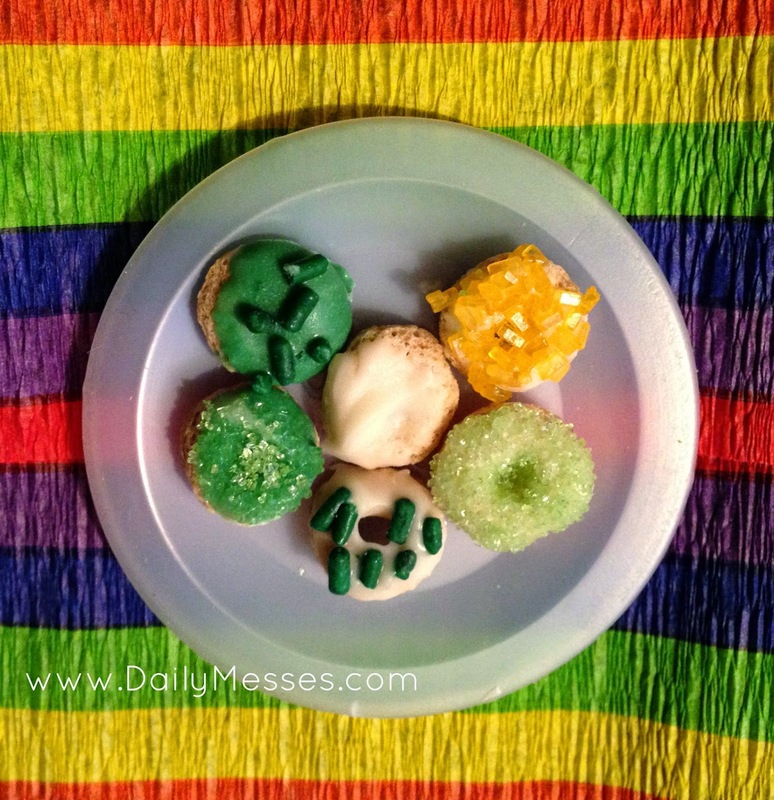 Leprechaun Donuts! These are super easy to make and were a big hit with my boys. 1. Melt the chocolate or candy melts. 2. Dip the Cherrios into the melted candy. 3. Place on wax paper and add sprinkles. 4. Let set. Once the "donuts" are finished, place on a plate. I found small things like bottle lids, or even the plastic piece in the pizza box that looks like a table, are great ways to display the treats.